The province of Como runs along the whole of the western shore of Como Lake and includes the peninsula at the centre of the lake. To the North it borders with the province of Sondrio, to the East with that of Lecco, to the South lies Milan and to the West one finds Varese and Switzerland. The current surface area is 1288 sq. 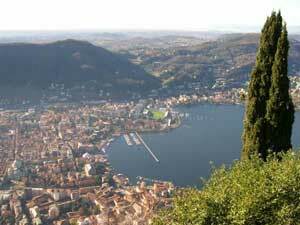 km, following the creation of the province of Lecco in 1994, which reduced Como�s territory by 1/3. But these figures can be deceptive for, though the area is small, in few other places you can find such a variety of environments, panoramas and settlements. In just a few kilometres you pass from snow capped mountains to lakeland, from wild alpine valleys to the industrialised hills of Brianza, from the city of Como to villages of just a few houses, from nature reserves in the North to ski slopes in the South. You can lie in the warm under an olive tree at the centre of the lake region and admire the year round snow on the Grigna peaks. The longest journey within the province does not exceed 100 km, so one can pass from city centre to wilderness or from summer to winter in an hour�s car drive. You might say that the province of Como is a distillation of northern Italy. Observing the province from above, one can see that man�s imprint on the landscape follows a North-South direction, most intensive in the South in Brianza and more rarefied in the North. Despite being quite densely populated (436 inhabitants per sq. km. compared with 379 in Lombardy and an Italian average of 189) the territory presents vast tracts where nature is still clearly king. In the whole of the mountain region, and above all in the upper lake area, one finds entire valleys with practically no sign of the presence of man and where the natural beauty is on a level with the most famous national parks. The Valle Albano, Val d�Arengo, Val del Dosso, Val Senagra, the Pian di Spagna and other locations host a rich selection of wild fauna. Wild stags, mountain goats and roe-deer are increasing in numbers, the ibex has been reintroduced into the upper lake area and is taking hold, the grey partridge, which had died out in the region, has returned and is breeding successfully. All the birds of prey are growing in numbers including the golden eagle. From the hares and pheasants of the plain to the forcello cockerels up in the mountains, the wild species bear witness to a healthy and carefully managed environment. The aquatic wildlife of the area is also well developed in the 9,800 kilometres(!) of streams and rivers. Even the Lambro which, after having flowed through Milan becomes famous for being one of the most polluted rivers in Italy, in its upper reaches is rich with quality fish stock: in Erba they fish for beautiful Fario trout! As far as water is concerned, the province of Como is a leader: it has the richest collection of lakes in the country, with a constellation of basins of various dimensions around the great protagonist, Lake Como with its memorable upside-down Y shape. Viewing it from above one can imagine its formation: a great glacier sliding southward carving out a deep gorge between the mountains and splitting into two as it encountered the massif of the Como peninsular. Lake Como is the deepest (410m) of the three major Italian lakes (the other two being lakes Garda and Maggiore) and one of the deepest in Europe, and the great mass of water influences the climate along its shores. 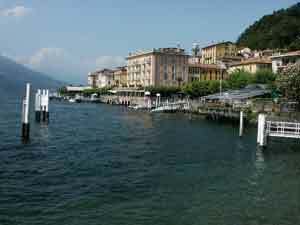 In fact, the central lake region and the Bellagio promontory enjoy a climate similar to that of the Italian Riviera. Laurel and olive trees grow in abundance, the gardens are full of palm trees and tropical plants, flower nurseries prosper. Meteorologists classify this climate as subcontinental temperate because it is influenced by the cold, dry air masses which move across from central Europe, and by the warm, humid fronts of the Mediterranean. Practically speaking, this means that the situation is extremely changeable, but within very comfortable limits: in Como the annual average temperature is 13�C, while the average between maximum and minimum varies between +2� in January and + 22� in July. The air is never too cold nor too hot.